Thank you to all who came out for our October general membership meeting. 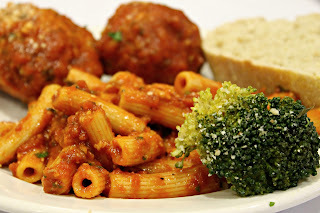 Frank and his crew at the Milano Cafe' really outdid themselves with such a fantastic meal, it was truly a feast of salad, roast pork, rigatoni, mounds of meatballs and Italian sausage, cooked kale, fresh Italian bread still warm from the oven, spumoni...and wine! Our guest speaker, CIAO member Judy Siefer prepared a tender breaded pork for everyone to sample for appetizers and it was delicious! Molto deliziosa! She was very entertaining and many asked for the recipe, but like any great Italian cook, her measuring consists of "a little bit of this" and "a handful of that". We're hoping to get the recipe and post it here soon. The winner of our cash drawing was David Converse. David was not present so the money goes back into the pot and next month's prize will be $300! David's name is back in the "hat" for another chance next time. Nominations for officers were taken and accepted. Nominations are as follows: For office of President, Wendy Flook. Vice President Steve Smith and Paul Bonito. Steve withdrew from the running citing inability to take on the time commitment required. Secretary, Parmie Herman and Treasurer, Bea Zuppardo. Because all of the offices are uncontested, these officers' terms will take effect January 2014 and will run a two year term. We also discussed details of our upcoming Reverse Raffle to be held November 16 at the K of C hall. Our reverse raffle committee led by Sue Page has been working tirelessly to collect donations for the raffle and auctions and sponsoring ducks for the wildly popular live duck races. They are still looking for more donations if anyone would like to donate items/gift cards/services etc or knows of a business that would donate. Anyone wishing to sponsor a duck may do so for $10 per individual or $25 for a business. The deadline to sponsor a duck is coming up very soon, please call Sue Page or send us a message here and we will pass it along to the committee for you. Overall, this was a wonderfully positive and productive meeting. We welcomed several prospective new members and enjoyed getting to know them. Their applications will be considered by the membership committee and then presented to the Board for approval very soon. We are excited about our growing family! Join us Monday October 28th at the Milano Cafe' for our October General Membership meeting. Hors d'oeuvres at 5:45, dinner will be served at 6:15 and the meeting will begin at 7. At this meeting, any member in good standing may nominate a candidate for all of the officer positions, terms begin in January 2014. Elections will be held in November. Our own member, Judy Siefer will be giving us an Italian cooking demonstration and everyone will get a taste. Judy has quite a reputation for being an extraordinary cook, so this will be a special treat! We will also hold our monthly cash drawing. Every member's name is in the bucket and must be present to win. Last month's winner was not present so the pot is up to $200 !